‘[T]he persecution of Christians across the globe… is an issue not discussed enough by progressives, partly perhaps because of a fear that it has become a hobby horse of Muslim-bashers. Anti-Muslim websites like Jihad Watch seize on examples of Christian persecution to fuel the narrative of Muslims as innately violent and threatening. ‘According to Rupert Shortt, who wrote Christianophobia: A Faith Under Attack, the persecution of Christians is a “liberal blind spot”, suggesting that we are “very, very sensitised to the perceived sufferings and complaints of Muslims, many of which I will be the first to say are justified.” I think this counterposing is unhelpful. It would be wrong for politicians to favour Christians abroad above other persecuted groups. Alstair Burt MP who was Parliamentary Under Secretary of State at the Foreign and Commonwealth Office until October last year and is a Christian, recently made this point. All of the major Christian advocacy groups in this country including Open Doors, Christian Solidarity Worldwide and Barnabas Fund agree. Their work is to see freedom of belief (and none) for all around the world. There is also though an uncomfortable truth that goes alongside this – that Christians are more heavily persecuted in more countries than any other religion. If you are speaking out against all of these injustices, the suffering of Christians will be on your lips the most. For some it is easier to say nothing and keep religion out of the conversation than face up to this reality and worry about appearing to be taking sides. Owen Jones is most likely right in his assumptions. If you try to find an instance of the previous Labour government speaking up on this issue (as I have tried to), there is a good chance you will draw a blank. This has not been the same with other parties, but Labour’s policy appears to have been to circumvent offending some religious sensitivities by avoiding issue altogether. ‘[A]s Christmas approaches, with its beguiling promise of “peace on earth and mercy mild”, how many of us will reflect on the words of our great Christmas carols and be reminded that Christianity was a faith born in the East? How many of us are aware that, while the first Christmas took place in the Middle East, there today that same faith is under threat? ‘Christians are being deliberately targeted and attacked because of their faith. But why, when popes and princes are speaking up, have so many politicians here in the UK forsaken speaking out? ‘Thankfully, some politicians have begun to speak up. Last month, Baroness Warsi gave an important and under-reported speech in the United States warning that a “mass exodus is taking place, on a biblical scale. In some places, there is a real danger that Christianity will become extinct”. And, earlier this month, the DUP MP Jim Shannon secured a debate in the House of Commons on the persecution of Christians. ‘But why, given the scale of the suffering, are these still such lone voices? ‘Across the world, there will be Christians this week for whom attending a church service this Christmas is not an act of faithful witness, but an act of life-risking bravery. ‘That cannot be right, and we need the courage to say so. This is new territory for the Labour party and a significant step forward. The mantra of ‘Not doing God’ has finally been recognised as fallacious and unwise, at least by some. There is no good reason whatsoever why freedom of religion or belief should not be a priority for every political party; it is a basic and essential human right. Douglas Alexander is flying the flag, but clearly he still believes there is more work to do to make sure Labour takes this responsibility seriously. Tomorrow, on the 8th of July he is hosting a meeting on international religious freedom with Christians on the Left and the All Party Parliamentary Group (APPG) for International Freedom of Religion or Belief, specifically to motivate Labour MPs to engage with the subject. That freedom of religion or belief will increasingly become a cross-party concern in the UK. If your local MP is a member of the Labour Party, it is not too late to invite them to attend. The more that all of those in parliament understand and acknowledge the importance that religion and faith play around the world, the better informed they will be to make sense of the significant challenges we face, both now and in the future relating to religion and the persecution that so often goes alongside it. Douglas Alexander is a good man doing good work. It is about time Labour wholeheartedly followed his lead. I believe this article is typically misleading again – nobody is try to stop anybody believing want they want to believe, it is when these people get together to form a cult and try to control other people where the danger becomes apparent. Admittedly, it is the Islamic cult which appears to be the most worrying, but so-called christians are not far behind. Slowly, but surely, the decent British citizen is getting their identity back, and has come to realise there is no god, and most certainly no son of god, in which to take orders from and as for guidance, the common sense we were born with is coming to our rescue. The day MUST come when all religion must be banned from ALL our schools, and when eventually we have elected a government free of secretive christians, we can then set about changing the constitution whereby our King or Queen no longer is obliged to ‘uphold the faith’. When we have achieved this, and have shown we can all live in harmony without religion, can we then set out on a MORAL CRUSADE to convert Europe and the rest of the world and banish superstitious religious practices from the face of the earth for good. Yes, because atheistic regimes have been SO good at taking care of everyone! Also, are you seriously trying to suggest that “Nobody is trying to stop anybody from believing what they want to believe”? Have you seen what happens to certain faith groups around the world? As Richard mentions below, Christians in Iraq are in fear for their lives if they seek to gather together and worship God. Gathering and worshipping together is part of the Christian belief, that supporting each other in our faith is what we are called to do. Whenever people are stopped from doing that they are stopped from following their beliefs. Of course your final statement betrays your arrogance and your true intentions, but let’s not worry about you being a bigoted, intolerant religiophobe (unless you deny writing ” MORAL CRUSADE to convert Europe and the rest of the world and banish superstitious religious practices from the face of the earth for good”). Oh no, let’s just carry on denying that people are being punished for their faith, sometimes even dying for it, not because they are trying to force it on anyone else but simply because they are wishing to practice what they believe. I repeat : Nobody is trying to stop anybody believing what they want to. Naturally, if you overstep the mark and gather together and show yourself to be a slave to your belief, that is a different matter. Worshipping is slavery, even more so if you are obeying the orders of a group of domineering men who themselves are obeying orders of unknown domineering men from thousands of years ago when people didn’t have a clue how we evolved. I also note your comment “when eventually we have elected a government free of secretive christians”. Do you mean to say that you think that anyone who holds a religious belief other than one that denies the existence of a God/gods is to be classed as a second-class citizen? Why not just revoke universal suffrage and enslave the blacks while you are at it?! Enslaving our coloured brothers and sisters would seem to be a christian practice … something your own bible tells you to do … oh, don’t tell me you only read the bits you want to read and ignore the nasty bits. But as for a god believer being a second-class citizen – let’s just say I hold no respect for a mature human being who chooses to believe in the existence of a god without the tiniest scrap of evidence as to its existence or even its probability. Care to quote me chapter and verse? Go on, just for giggles? Care to disprove the existence of God while you’re at it? Because I can go through the argument for the existence of a creator-being that is pretty watertight quite happily if you want. And, of course, we can add in the way that historical documents are considered to be accurate and valid sources of knowledge about history to prove to you that the gospels are accurate in what they tell. And then I can point out to you that within the gospels we see Jesus, the main character of the gospels, talking about the collection of books we refer to as the Old Testament and not denying a single word of them. Of course you will dismiss all of this as nonsense and rubbish it as much as you are able, but none of your arguments can deny the fact that EVERYTHING in this universe requires an initial cause that is not dependent on time or causality (i.e. God), that the writings in the New Testament are more valid as recorded history than the history of the Gallic wars written by Caesar, Plato’s Tetralogies or histories written by Pliny the Younger or Tacitus. So you are either left with denying that history is as the rest of the world accepts it to be (because the rest of the world accepts Pliny, Tacitus et al) and denying the very nature of the cosmos, or you must accept that your arguments are flawed and you need to rethink. Now, of course you can decide to believe in God and simply not like Him because of what you believe He wants people to do. But then you would also have to open yourself up to actually reading the Bible properly and listening to people explain it for you. But I don’t see you as being that sort of type (though I would love to be proved wrong) I shall expect either silence (though this is not likely, given your track record) or some long-winded attempt to deny everything that I have said here. “WE ARE IN THE MOST DESPERATE SITUATION WE HAVE BEEN IN SINCE THE WAR IN 2003. The total infrastructure of the country has fallen to pieces even basic communication facilities like Facebook have all been closed down. “We have no government very little food and for the first time huge opposition against Christianity. Churches have been attacked, Christian homes destroyed and thousands of Christians have fled there homes to seek safety and refuge. Andrew is highly regarded internationally for his humanitarian work which is supported by the Foundation for Relief and Reconciliation in the Middle East. So ISIS have given the ‘christians’ a choice have they ? That is more than the Muslims received during the shameful crusades, they were slaughtered with no questions asked … much the same as Tony Blair’s and Bush’s crusade when the Muslims were just blown to pieces – women and children too. And who can blame the Muslims for extremism when over several hundred civil engineers sign a letter stating categorically that no plane could have caused the world trade centre towers to collapse in on themselves like we saw on TV. This was the work of highly skilled explosive experts but we can only speculate who they were working for. Yet the US ruthlessly blamed Osama bin Laden, hunted him down and murdered him and his family. His denials were not broadcast on TV. Evil, right-wing ‘christian’s’ – lower your heads in shame. Couple of points. First off, you do realise that the Crusades were in response to an Islamic invasion of the Holy Land, right? So it was not an unprovoked response, right? Not saying that it was right, or that it was a Christian act (people often use religion, or non-religion for that matter, as an excuse for barbarous things), merely pointing out that there was slaughter on both sides. Secondly, are you suggesting that reacting in a violent manner is an acceptable way to respond to another’s violent action? Also, just out of curiosity, are there any more conspiracies that you would like to mention while you are at it? Or do you have proof that bin Laden recorded denials? One final point, you do realise that Christians were also heavily involved in (and in some cases the instigators of) demonstrations against the war, yeah? Thanks Neil (have only just caught up with this). Re 9/11, became very familiar at the time with the well-known details (and many others) you state and so I agree with you, particularly in view of GW’s offensive ‘throw-back’ name of the US retaliation. As I stated on a recent posting here, the issue is really Churchianity v Christianity. That is, man-made religion v following and doing what Jesus said. Yes, freedom of religion is a basic human right. But why should it be a priority for any political party? All I can say to your question is this; why shouldn’t it be a priority? Why not prioritise it and pay attention now? As an essential human right, like any human right, it needs to be addressed; not left alone/ pushed aside. That is my opinion, anyway. I don’t think it should be a priority because for most people it is not a priority. At the end of the day, people can do without religion, whereas people need food, jobs, education, a place to live, freedom, law and order, transport, heating and lighting, leisure and a whole host of other things. I respect your opinion Dave but as I said above, a human right (regardless of what it is or who chooses to use it) needs to be addressed. Just because you might be able to “do without religion” it doesn’t mean that your neighbour can. A human right is a human right, is it not? Obviously persecution abroad is an important issue, and perhaps politicians have been disproportionately silent. But they’ve been too silent on a whole host of things that happen *elsewhere*. This should not be counterbalanced by christians here disproportionately talking in the public sphere about the persecution of christians elsewhere – because it would seem as though the motivation is about protecting ‘our lot’, rather than something more genuinely Good Samaritan-esque. I think the point has been missed that in many of these countries atheists are just as persecuted. Prehaps when christians realise they havnt got the monopoly on persecution, they might stop feeling sorry forthemselves and actually work towards ending the persecution of any group. If you take a look at Christian organisations who work in this area, they are actually fighting for the rights of atheists alongside those of Christians. This is a common misconception. People are persecuted in many countries for a variety of reasons. Being an Atheist or Gay in some Islamic states will result in death. Being a citizen in some countries means oppression by the very nature of how the country is run. Some are persecuted for being in the wrong tribal / national group and we think of the Genocide and ethnic cleansing in recent years in Rwanda and Bosnia which received widespread global condemnation. The call to speak out about persecution of Christians is not due i think out of self interest but rather the scale and targeted nature of the persecution. Christian groups have a long history along with others of goodwill of speaking out regarding injustice in many diverse situations. The reports we hear from Open doors and Barnabus fund are truly horrendous which all parties and government should condemn unconditionally regardless of the political sensitivities. It was a ‘delusional’ instead for the world still awaits an apology for the crusades. People who choose to live in glass houses shouldn’t throw stones – you knew of the terrible crimes they committed before you chose to be one of them. Secondly, ISIS and other Sunni fundamentalists (I read) have historically been, and presumably still are, supported by Saudi Arabia – good friends of those on the Right more so than the Left. So will you be advocating sanctions or other forms of coercion on your friends for the sake of persecuted Christians rather than selling them arms in the £millions? – Cameron and the Right are particularly keen on selling arms regardless! I agree the Left have been queasy on challenging Islam. But, for the reasons given above, I don’t think the Right are on anything like higher moral ground to be criticising the Left. Nim, re your 2nd point on the Saudis and ISIS. so, yes, ISIS and others would love to take down the house of Saud but they’d be up against the West who give the Saudis license to do as they want so long as they keep the oil taps open – wide! Meanwhile the pure hatred that exists between the two Muslim faiths is beyond my comprehension but it is literally of (nuclear war) world ending proportions. So, no, I stick to my assertion that it is predominantly Right wing support and not the Left, as Gillian would have us belief, who are more culpable for the evils fellow Christians are suffering in the region. Appreciate your reply with link to very useful site Nim. Thanks. Recall photo of Obama bowing deeply to King Fahd in London, 2009 and Saudi deep fury at his throwing Mubarak ‘under the bus’. Yes, the oil taps talk loudest and all US presidents have sucked up to them. Men seeking power influence territory or wealth will attach themselves to anything in order to get it whether it be religion, naked capitalism or any number of totalitarian ideologies. The teachings of Jesus speak against all these human failings. With regard to corporate greed and corruption including the sale of arms Gillan has previously posted criticising these aspects of capitalism and right wing politics. I have found his posts generally even handed trying to look at any given situation from a number of different angles. Its not about left vs right for him but rather that the labour party has been slower to condemn this inhumanity than other groups and political parties. Neil, Neil, you can’t win here… These are Christians – remember religion is just institutionalised narcissism and victimhood is itself a species vanity. Yes, there are people all over the world who suffer for their beliefs, but none more so than the Christians (mind you, in South Sudan, you give the Christians their own country and they still beat the living shite out of each other). Gillan forgets, like many blinded by their own self-importance, that one of the reasons why Christians suffer so much in the world is that in many places, Christianity is associated with the West and as such is also associated with the centuries of oppression and political meddling that forced many non-Christian societies into subservience to the West. But Gillan isn’t troubled with the inconvenient truths of history – where Christianity happily oppressed and manipulated much of the world. He is more concerned with getting his little voice heard and overcoming that malady that is the bane of many a vocal Christian: a desire to tell the rest of humanity what to do. What seems best for protecting the freedom of religion, if we look around the world, is of course secular democracy. Anywhere where religion gets political power very quickly results in the oppression of this or that religious group. For centuries in Britain, Catholics were killed and tortured and non-conformists were second class citizens. On the continent, Catholicism ensure freedom of belief and freedom of speech was quashed by torture and execution. So zealous, were Christians, in the middle-ages, to extol their religion that they went to Muslim countries, where Christian, Jew and Muslim had lived side by side for centuries, yet they slaughtered Muslims, Jews and Non-Catholic Christians reaping the enmity we still experience today. And I can bet you tomorrow, that if Christians were given greater political power, they would, soon enough, be at each others’ throats – about ‘what is TRUE’ religion. Wherever two or three are gathered in Christ’s name, you can bet there’ll be an argument among them sooner or later. Similarly in the modern age, Christian Europe – and latterly Christian America – sought to rule and dominate other societies (remember the Land of the Free and the Home of the Brave was founded on genocide and slavery). Obviously we should demand religious toleration in the world, but this has to be a seamless garment. Democracy voted in the Muslim brotherhood in Egypt, it was removed by a vicious military coup – yet the West stood by and pissed on democracy. We invaded Iraq because it did not comply with a few UN resolutions – Israel has ignore legions of UN resolutions and it gets bank rolled by the USA for its ‘crimes’. The West is no guardian of democratic or egalitarian values: it picks its causes to serve its own self interest. Syria can rot – but it won’t be long before the West rallies to Iraq’s aid – there’s too much oil at stake to worry about the rights of Sunni Muslims, oppressed by the Shea government. How can the West be seen as a bastion of upright moral justice when it turns a blind eye to human rights’ violations when it happens to be smelly Muslims and bends over backwards when it happens to be Jews or rulers with oil? Chappy, I totally agree with alot of what you said, however, you lost it a bit when you started getting personal. Your obviously an intelligent guy and your point was good without resorting to name calling. Just a quick comment to say that I don’t condone the crusades, Western imperialism, nor the killing and torturing of anyone irrespective of what they believe. None of these are, or have been Christian, even if they have been done under that banner. “This is where we get twisted in knots. In international politics religion plays such an important and defining role, and yet our own political discourse tries to ignore it. Nobody quite knows what to do. 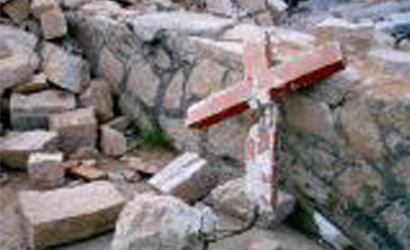 If we mention persecution of Christians, does that mean we are ignoring other groups? No. Does it mean we think we should prioritise them over other groups? No. It means that Christians are our neighbours too.